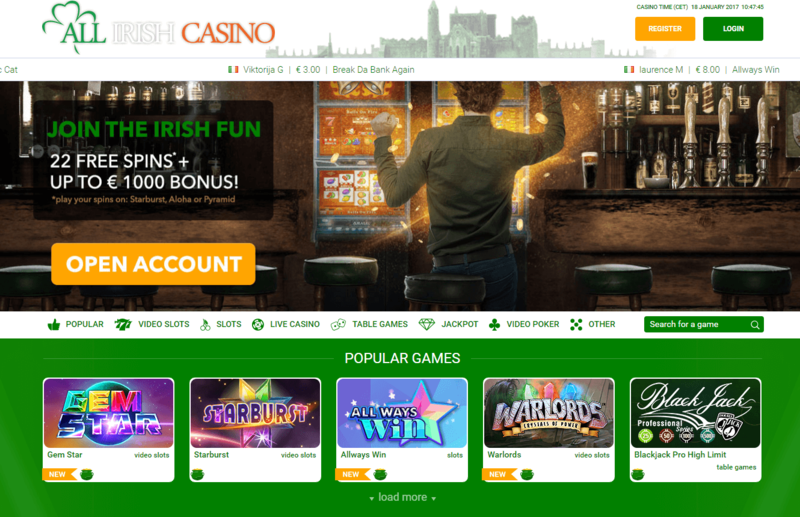 "A relatively New Casino that's focused on the Irish punter..."
All Irish casino is not only for the Irish – it’s for most anyone who uses the Euro as their form of currency. 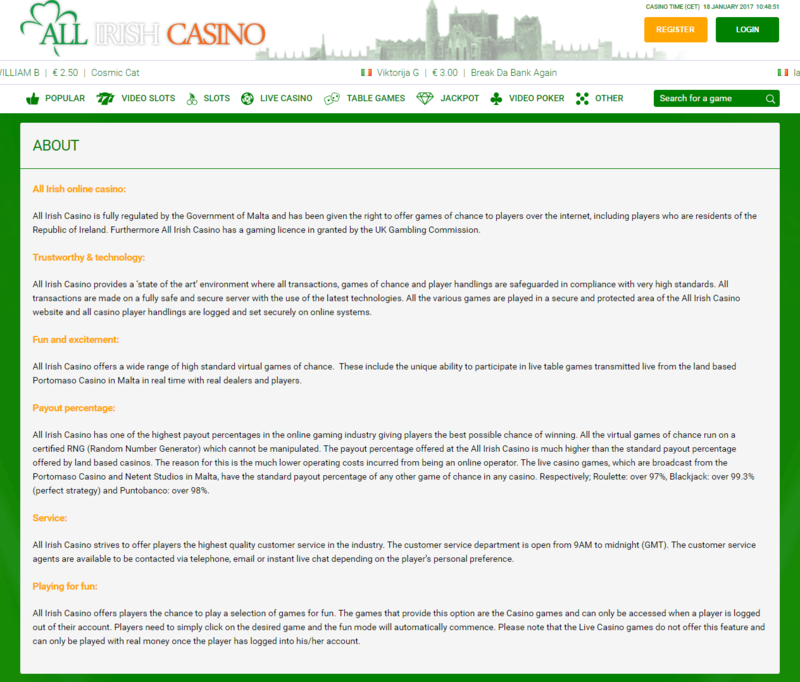 All Irish Casino is relatively new – and is a sister casino of the L&L Europe Ltd. brands. Which so far are well managed. 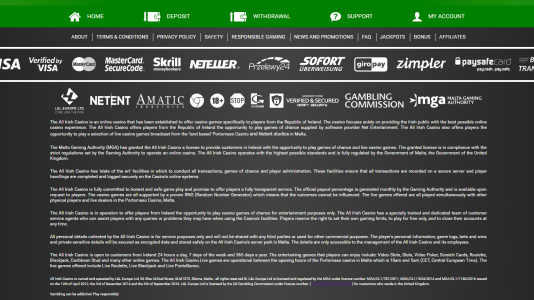 They have the standard software package provided by NetEnt, Amatic, Big Time Gaming and Microgaming. These can be played in your browser, mobile, or tablet. There is no download needed. They also have live games which you ought to try. Unfortunately, their video poker is limited to your basic one hand VP. If you are looking for video poker, I would recommend a Microgaming downloadable casino. These you can find at Casinomeister. Their payout time is average – under 24 hours if on a weekday. Their reverse time is the same as their payout time – so please be aware of that. 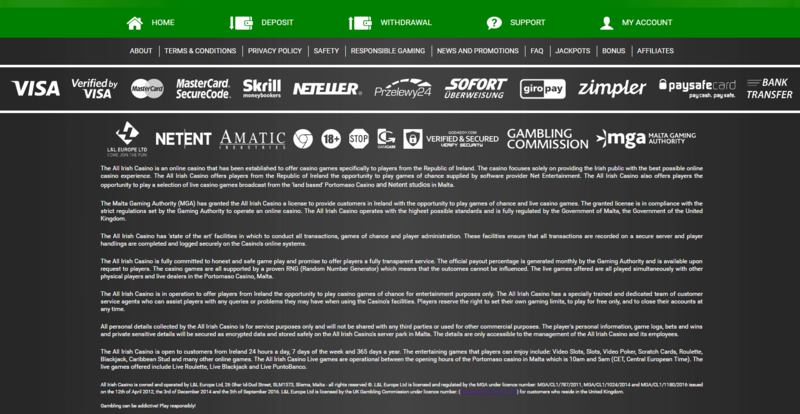 Their withdrawal limits are pretty good – up to 5000 Euros per day which most punters won’t have issues with. This excludes progressive jackpot winnings which are paid in one lump sum. If you are a UK player, please be advised that you can only have one account at only one of their casinos – the L&L Europe bands. They are licensed in Malta and in the UK. We have had no submitted complaints at Casinomeister – and their Baptism by Fire went by without a hitch. All in all, they are a great choice for players . 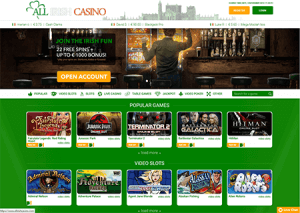 All Irish Casino was launched in March 2013 and accredited at Casinomeister in November 2016. They are a casino under the L&L umbrella – which means they are connected to All British Casino, All Australian Casino, NoBonus Casino, and their other sister sites – which means that UK players can only have one account across all of their properties. Their customer service seems to be well managed – they are responsive and helpful. 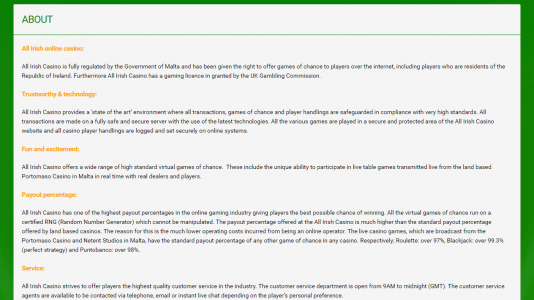 Additionally, their casino rep is very active in the forum – so they have a finger on the pulse of the industry. Navigation of the website: It’s basic – easy to sign up, deposit, find games, and if you’re lucky enough – to withdraw. The games are organized by category: most popular, video slots, slots, live games, video poker, table games, jackpot games, and other games. The “other” games are mostly bingo and other odd games that I don’t know why people bother with them. But y’know – to each his own. You can search their games but only for game titles. So if you are looking only for Microgaming, or for slots with free spin bonuses, etc., you may have issues. But since the amount of games are limited, it’s not that big of a deal. I would suggest to the operators, if and when they start expanding their compilation of games, to include a more robust search engine. Promotions Their sign up bonus is non-intrusive. In other words, they don’t bang it over your head when signing up. 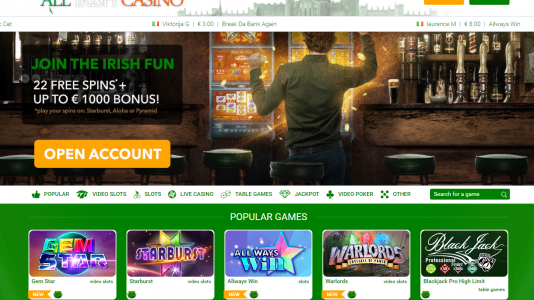 Their sign up bonus is a standard 100% up to €500 on your 1st and 2nd deposit. The wagering requirement of the welcome bonus is 40 times the bonus amount. Please read all of the terms and conditions when accepting any promotion. They have a number of current promotions – for the month of November, you can win a BMW Z4 – please check out All Irish Casino’s promotions page for the current promos. Their customer service is in-house and is located in Malta. It’s primarily focused on Europe and only available from 10AM to 1AM CET time. Signing up is relatively simple. Just fill out their online registration form and you’re in. Depositing is just as simple using Visa, Mastercard, Skrill, Neteller, Paysafe, Przelewy24, Sofort, Giropay, Zimpler, Bank Wire. Once signing up, you can be playing within minutes. Ratings: Their ratings are relatively good – payouts are around 24 hours, but no weekend payouts, and their withdrawal limits are €5000 per day – which for most folks is acceptable. NetEnt, Amatic, Microgaming. It’s a bit limited, but for many it’s enough. Unless of course you are a video poker player – only downloadable Microgaming casinos offer awesome VP. They also include live games as well. All Irish Casino is a reasonably good casino. They are well managed by a knowledgeable crew, and are responsive. They are a player focused casino, and you should not have any issues with them.